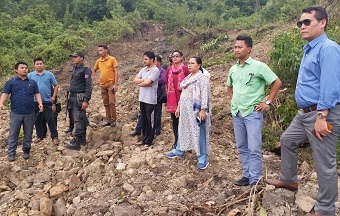 Manipur Water Resources Minister Letpao Haokip accompanied by Social Welfare Minister and Kangpokpi MLA Nemcha Kipgen on Wednesday inspected flood-ravaged areas in Kangpokpi district. The ministers first visited Makuli area under Champhai sub-division of Kangpokpi district, along with Deputy Commissioner of the district, Dr Rangitabali Waikhom. The ministerial team inspected the two bridges that were damaged by the mudslide caused by the heavy rains and floods. The two bridges, both RCC, were built as a part of the PMGSY-funded Makuli road. Several sections of the said road were also blocked by debris of the landslide and other several portions being pushed down. It may be mentioned here that Makuli is the area where river Kali originates and it joins the Imphal River flowing along with Imphal-Dimapur highway side by side at Kangpokpi bazaar area. Hence, it is quite instrumental in the recent occurrence of massive flood in the six valley districts. Later, minister Letpao, while speaking to the media persons, said that the villagers of that area are quite worried that more landslides and mudslides might occur again. He assured that his department and the State Government in general would extend all possible assistance with all the available resources, and appealed them not to panic. The minister also further added that his department and the Rural Development and Panchayati Raj Department would take more initiatives in the restoration works as the matter is in the domain of the said two departments. Having said so, he appealed to all the departments and the officials of the district administration to render full co-operation in the restoration and preventive works related to flood, and to keep aside differences, if there is any. Later, the ministers also halted for a while to inspect the flood-affected bank of river Kali at Kali bridge area of NH-2. Manipur is reeling under the flash flood after massive rainfall for three continuous days last week. As a result, 1,62,021 people have been affected while 29,227 individuals from 156 affected villages are taking shelter across 129 relief camps as per Relief and disaster management department reports as one Wednesday 4 pm. The floods have also affected 4350 hectares of crops land besides claiming 9 lives till date.